The struggles of a coterie of neurotic, underpaid, underloved department store clerks are brought to the screen with the delicacy and grace of a fine ermine purse by that German-expat genius Ernst Lubitsch, in this wonderful 1940 comedy. 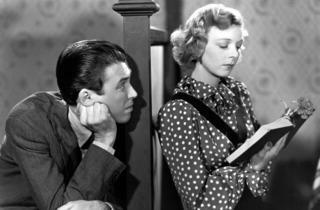 At its centre is Jimmy Stewart playing bookish grafter Alfred Kralik, who penfriends a dame more enlightened and worldly than any of his colleagues (or so he thinks). But this is as much a film about group dynamics in the workplace and how the distress and desperation inflicted on those at the top of the ladder can trickle down to the rank and file as it is about romance. For my money, this is Lubitsch’s masterpiece, an immaculate conflation of his sprightly shooting style, expertly layered wisecracking and bracing realism, all topped off with a romantic subplot that offers a nakedly joyous celebration of young, serendipitous love. Now, does anyone know where I can buy a cigarette box that plays ‘Ochi Tchornya’?